State-of-the-art equipment from Daikin will provide energy efficient heating and cooling for the 22-story high-rise facility. The Union Dallas, a new 800,000 square foot mixed-use construction in the Uptown Dallas neighborhood, was equipped with an innovative, high-efficiency HVAC system from HTS Texas, the Texas partner of the largest independent commercial HVAC manufacturers' representative in North America. The system’s four 30,000 lb. Daikin Applied AWV Pathfinder® air cooled chillers were crane lifted to the building’s rooftop, where they will supply heating and cooling capabilities for the 22-story Class-AA office tower. The Union Dallas, which began construction in 2016 and is scheduled to be completed in 2018, will include two towers and offer 417,000 square feet of premier office space, a 309-unit residential high-rise building and 87,000 square feet of retail space. Located in downtown Dallas at Field Street and Cedar Springs Road, The Union Dallas will reside near several local hot spots, including Klyde Warren Park, American Airlines Center, and the Perot Museum of Nature and Science. 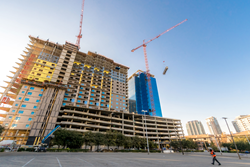 To accommodate the development’s size and anticipated occupancy, The Union Dallas required a powerful HVAC system capable of serving the high-rise construction. Building owners and construction teams turned to HTS Texas to select the HVAC equipment and design an ideal solution for this unique project. When selecting the equipment to implement for The Union Dallas, representatives from HTS Texas made the decision to steer the project’s HVAC system design away from the initial plans, which called for the use of water cooled chillers. Key considerations for HTS Texas’s equipment selection focused on the dependable reputation, footprint, and efficiency of Daikin’s air cooled screw product. By suggesting that the project utilize an air cooled system rather than a water cooled one, HTS Texas was able to present a cost-effective solution to the construction team, and save the facility millions of gallons of water usage each year. The four air cooled screw chillers are also 100% configurable with Daikin’s VVR technology, which allows complete control to save energy while still accommodating varying occupancy needs, regardless of ambient temperature or time of day. Daikin designs and manufactures technologically advanced commercial HVAC systems for customers around the world. Founded in 1924 in Osaka, Japan, Daikin is the world's leading manufacturer of air conditioners and refrigerants. Daikin is dedicated to the superior manufacturing of water cooled chillers, air cooled chillers, air handlers, rooftop air units, self-contained units, fan coils, water source heat pumps, and more. To continue developing their U.S. operations, Daikin opened the doors to a state-of-the-art manufacturing facility in Texas in 2017. The 4.2 million square foot, LEED Gold certified campus allows Daikin to consolidate manufacturing, engineering, logistics, marketing, and sales for their heating and air conditioning products in one location. The facility is designed to encourage collaboration and innovation of Daikin employees across departments, and provide better service and easier access to products for customers throughout Texas. “Daikin’s commitment to worldwide HVAC leadership was represented by the grand opening this past year of the industry’s largest manufacturing facility, Daikin Texas Technology Park (DTTP), just west of Houston in Waller, Texas. Daikin’s commitment extends to premium manufacturer’s representatives who we believe will grow with us. HTS has been instrumental in propelling sales of Daikin Variable Refrigerant Volume (VRV) products, providing industry leading solutions for Daikin VRV products in Texas, and we are grateful to have HTS with us as a committed manufacturer representative of Daikin intelligent solutions,” said Marc Bellanger, director of marketing for Daikin North America LLC. HTS Texas has maintained a partnership with Daikin since 2001, when HTS began its Texas operations. As a manufacturer’s representative, HTS Texas provides Daikin equipment and parts in seven offices across the state in Dallas, Fort Worth, Austin, Round Rock, San Antonio, Houston, and Beaumont. In recent years, HTS Texas has continued to grow its business, and earned recognition as a part of the Inc. 5000, which ranks the fastest-growing private companies in the U.S., for three consecutive years from 2015 to 2017. This growth is evident in the company’s DFW offices, as these regions provide unique opportunities in a growing economy that draws in businesses from a variety of vertical markets, from healthcare and data centers to higher education and commercial office. As a full-service HVAC solutions provider, HTS Texas is committed to delivering real success to all parties who interface with a project’s HVAC equipment. HTS Texas employees develop a strong understanding of all products the company represents, and offer the industry expertise necessary to determine the best solution for a broad range of applications. The company’s HVAC expertise, combined with a full suite of specialized departments focused on equipment, building automation systems, airside products, parts, and service, allows HTS Texas to provide support for HVAC systems through the entire product life cycle. To learn more about how HTS Texas designed the HVAC system for The Union Dallas, view the project video here. Daikin Applied, a member of Daikin Industries, Ltd, designs and manufactures technologically advanced commercial HVAC systems for customers around the world. Customers turn to Daikin with confidence that they will experience outstanding performance, reliability and energy efficiency. Daikin Applied equipment, solutions, and services are sold through a global network of dedicated sales, service, and parts offices. A privately held, wholly integrated commercial real estate company based in Phoenix with corporate offices located in Dallas, TX and Overland Park, KS, RED maximizes asset value and performance for its high-quality retail and mixed-use portfolio that comprises 34 properties, totaling nearly 17 million square feet in 11 states. RED is well known for developing the large-scale CityScape project in Phoenix, a new office, hotel, residential, and entertainment destination that has re-energized the city’s downtown adjacent to professional sports venues including Chase Field and US Airways Center. For more information, visit http://www.reddevelopment.com.